The pattern information is composed of the pattern name, and the number of beats in the pattern. The pattern to change is highlitghted, and "Edit Properties" selected. The title area of the screen displays the original name (NewPattern in this case). 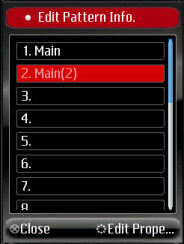 The pattern's name is changed to Main here, any name will do. It is not possible to give the same name to many patterns, pattern names must be unique in the project. 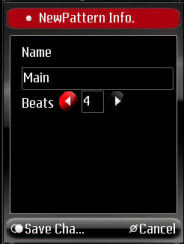 The number of beats can be changed, shortening the pattern clips the end of the pattern. So any beats edited byond the new limit will be lost. Lengthening the pattern with more beats adds blank steps to the pattern. Selecting "Save Changes" saves the changes, "Cancel" closes the screen without applying the changes.